St. Patrick's Day Cupcakes in ombre style. Three shades of green and a whipped frosting. Perfect for your St. Patrick's Day Party! Prepare white cake mix according to package directions. Heat oven according to box instructions. Line a muffin tin with 24 cupcake liners. Split batter into two bowls. Color one with food coloring. A deep green will take varying amounts depending on if you are using gel or liquid coloring. Liquid will be over 50 drops. Mix well. Slowly add green food coloring to the second bowl, starting with just a quarter of what you used for the first. Do the same with the third. Add until you have noticeably lighter color than the first and second. Spoon a heaping tablespoon of the darker batter into each lined cupcake tin. Using a fresh spoon, do the same with the two lighter colors. Bake according to package directions. Remove and allow to fully cool. 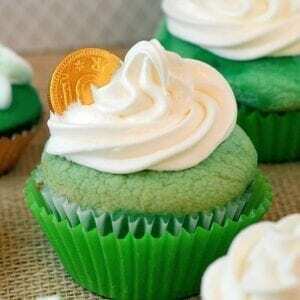 Adorn with gold candy and watch eyes light up for St. Patrick's Day Cupcakes!